Two great 1969 wines I bought recently a bunch of old bottles of wines, using the popular classifieds website Le Bon Coin, where you can find anything in France, from your car to your house. You first choose the region where you're staying and then you type the item you look for, there's no fee for the seller and you can pay on the spot when you go in person check the thing. Whatever, I found out that the prices weren't always very high and I tried my chance on a couple of old vintages that we just had the pleasure to drink with B. and a few friends gathered at her atelier in the Paris suburb. This was a total surprise and a total success. First, I bought 3 bottles including a Jasnières 1969, a Muscadet 1989 (old vines, hand-picked, Famille Luneau - undrinkable, awfully corked) and an Alsace Riesling 1997 (Dopff & Irion - ok, nice pleasant drink, lots of SO2 maybe), the Jasnières was my target, in spite of the fact that there seemed to miss a bit of wine in the bottle. The woman wanted 30 € for the whole and ended making me an offer for 20 €. Done deal. The other bottle I stumbled on was a Brouilly 1969 by a négoce named La Croisade du Bon Vin, located in La Chapelle de Guinchay, a village where the family of Jules Chauvet happened to own several vineyards back then (scroll down on this story for details). I hadn't read the fine print when I decided to buy the bottle, I just considered that back then Beaujolais was pretty clean in terms of vineyard management and winemaking work, and that I coult take the risk, especially that only maybe a centimeter of wine has evaporated through the cork in this bottle. I'm not knowledgeable in terms of old vintages although I think that it is captivating to experience bottles that travelled this long way to our table. There's a very experienced person in France on the matter, François Audouze, he writes and posts pictures on his blog about his picks and experience drinking old vintages, enjoying the rare bottles in special dinners. One of the good places to find bargains is the auctions in Paris, you get batches of old bottles which can be very affordable if they're not from a reknown domaine. Magic color The trick was to open the bottle, I had try to find an air-pressure corkscrew with a needle which I have for a few years but couldn't find it (I don't use it very much, I heard that the pressure on the wine might not be good), so I resorted to a normal corkscrew but there was quite a chance the cork fall apart, so I was very careful and only the last centimeter remained in the bottle neck, and it was easy to take it out without spoiling the wine. An interesting detail to notice is what you can read engraved in the glass (pic on left), it reads "Not To Be Refilled" and on the other side "Ne Pas Réutiliser", and the reason is simple : at the end of the 1960s' estate bottling was still rare in the Beaujolais and there were many returnable bottles (with deposit) which you'd bring back to the grocery store or the wine shop, and these bottles for a change were single use. The color by itself was already a small wonder. The wine develops an oxidative character, which is no wonder as a few centimeters of wine were missing. At the opening of the bottle, the aromas were at first very closed, and it really opened after about half an hour. In the mouth, there's a fullness feel, the wine still tells a story. This wine has still a nice substance and mouthfeel expression, giving a nice vibration. Tender aromas, honey, butterscotch, fruits, exotic-fruit style. The attack is vivid, B. says that this wine must have been quite bitter, this terroir being traditionally acidic. Another wonder from 1969 When I called the man who was selling this Brouilly 1969 (also through Le Bon Coin), he told me that the bottle came from his parents' cellar in the French province and that it had been safely stored there in good conditions during all these years. He was keeping for himself the reasonably-old vintages and selling the ones from the 1960s or 1970s'. I thought that in spite of the missing wine (pictured on left just before I pulled out the cork) there could be something interesting in this bottle, missing wine not being automaticly synonym of spoiled wine. The guy was selling this Brouilly 1969 at 30 € and I didn't bargain, we met near Port Royal and made the deal on the sidewalk near my motorbike. The label of this Brouilly 1969 refers to a négoce named La Croisade Du Bon Vin, based in La Chapelle Guinchay. There's no trace online of this obscure négoce but I'm inclined to think that these négoces, even obscure ones, could sell pretty good Beaujolais then, remember that anyway most of the wine in this region like many others in France used the négoce conduit to reach the consumer. And Beaujolais in the 1960s' was still in its stage of genuine wine tradition, the juices were not heated there yet (it started in 2001) growers did not spray herbicides and draft-horse use was still common for small growers. There may have been instances where truckloads of darker wines from the souther regions was blended to pale Beaujolais on certain years but on the whole I tend to trusty more the wines from this time than the ones from our modern-enology era. It's only after having purchased this bottle that I discovered after some research that 1969 happens to be among the top best vintages for Beaujolais, can you believe that ! It's even the 2nd best, If you read through this page about the best vintages of Beaujolais (in French), 1969 is rated as THE vintage of the century, only one surpasses it, 1959 (vintage of the millennium). This may also mean that for this vintage it is less likely that chaptalization has been used because the natural conditions were met so that the winemakers didn't resort to this correction (probably the only one used then in this region). From it's outside look the cork seemed in better condition, not wet all through, but in fact, as soon as I screw carefully the corkscrew into the cork, I felt that it was very soft and likely to fall apart, so again I had to pull very very slowly to prevent tha accident. It did break apart at mid course but I managed to have all the cork come out. My needle air-pressure corkscrew would have been useful for this type of wine and I'll try to find it if I buy again an old vintage one of these days. You can see on the picture that the color is still there, meaty and alive. It's a relatively light color like a true Beaujolais, and it is a bit turbid, almost milky. The nose was hard to tell because we didn't rinse our glasses and still had the now-opened aromas of the Jasnières. In the mouth, a slight sugary feel (would they have chaptalized this wine after all ?). Aromas of old wine, of cellar maybe too. B. finds notes of raspberries in alcohol. The wine titillates the end of the tongue, it has a vivid energy and goes down well, here is another pleasant miracle given the years and the missing wine in the bottle. Plus, it paired so well with the roast duck, a real pleasure. I even found that it paired well with the cuncumber salad with wakame sprinkled with shredded dried fish. Coincidently as I was in the middle of this experience, Jancis Robinson wrote an interesting story in the Financial Times, titled Bojo with Mojo, precisely on the subject of old Beaujolais, and at one point she tells of a good surprise with a generic Beaujolais 1970 sililarly bottled by a négoce. It also had a crumbly cork but was delightful and perfectly fresh. A little sweet but still vigorous, and, with the Beaujolais combination of vibrant fruit and appetising acidity, wherever it came from. I only regret that she didn't tell about the large gap between the winemaking and vineyard-management ways of that time (the 1960s') and the modern ones (herbicides, fertlizers, wine corrections, heating of the juice...). Another version of conventional farming With all these visits you're having regularly through WineTerroirs in wine farms where life is in the front seat, you might forget how mainstream vineyards look like in France, call them conventional or "reasoned agriculture" (this newspeak concept of agriculture raisonnée meant to hide its chemical nature) or whatever term intended to give a pass to the chemical destruction of the soil. So, to counter the fasle impression of vineyard health that this website may convey, I'll post from time to time a random picture to give you a booster shot about the sad reality behind the average AOC wines, about what you missed with all these commercial domaines. You can also bet big money that the wine made from this vineyard gets its appellation without any hindrance, it'll be stamped right away with the prized AOC, and this, without hesitation or second thoughts by the commission d'agrément people, this wine will definitely be conform.... A natural-wine tasting event in New York  I just received the notice by Thibault Chauvet that a natural-wine tasting event named Prestige Wine Lounge will take place in New York next june 15. Thibault who has been formerly working at Le Verre volé in Paris now works in N.Y. for Zev Rovine Selections, a wine importer specialized in artisan wines (the producers' list is really impressive). Thibault is the organizer of this event and he coordinated several influential wine people in New York for that purpose : The event is the result of the cooperation between 5 leading importers of natural wines (made from organic/biodynamic vineyards) : Dressner, Rovine, Selection Massale, Fifi's Imports (the Ten Bells) and Nicolas Palazzi (PM Spirits), and it will take place in the backyard of Cleveland, each importer bringing at least 6 cuvées for the public to get a direct experience with different expression of natural wines. There will some food as well, prepared by chef Max Sussmann. Thibault Chauvet had noticed after arriving here in New York that importers used to have their tastings separately and he thought this might be good to have them cooperate and do something together. This sounds like a good initiative, mirroring the one that led Japan wine importers to organize Festivin in Tokyo. Hirotake Ooka holding his Saint-Peray I tasted a few wines from the Rhone the other day at yet another of these delightful free sidewalk tasting at Caves Augé, the Bd-Haussmann wine shop in Paris. I began with the standing barrel of Hirotake Ooka (Domaine de la Grande Colline), actually I was impatient to taste his new release of Cornas, but as the wine isn't among the cuvées sold at Augé he hadn't brought a bottle. __ Le Canon, Vin de France (table wine) 2013, a white wine made from Muscat de Hambourg. 3000 bottles. I don't spit, that goes down well. The label says 12,5 % alc but Hirotazke says that actually it's 10,8 % ! He printed a large quantity of labels and keeps them year after year, that's why. Costs 4,8 € without tax. __ Saint Peray 2010. White wine made from Marsanne. Soil : clay/limestone. 24 months in barrels (the cellar deep under the hill is very cold and things takes time). Color : translucent gold. Mouth : fresh, and lots of energy, lovely wine, there's an almost indistinguishable fizziness at the end of the tongue, Hirotake says that the wine refemented a bit after 6 months of bottling.. I feel a light sugary side which is erased by the freshness and what I think is the minerality. No added SO2, there's never any added sulfites in Hirotake's wines. Costs 10 € w.t. __ Le Canon 2013, Vin de France, red wine, or rather rosé. Majority of Syrah with 10 % Carignan, 10 % Grenache and 10 % Viognier (which he purchased the grapes of). Usually his blend for this wine is 50-50 Grenache/Syrah but there was little grenache to pick in 2013. The nose is very enjoyable. Aromas of small ripe red fruits. Ripe flowers. The Viognier brings the aromatic side, Hirotake says. Mouth : a bit tannic, lacks a bit of body maybe. Costs 4,8 € w.t. __ Syrah Vin de France 2011. Normally, this is a Saint-Joseph 2011, but the wine was rebuffed at the first passage in front of the AOC commission under the pretext of defaults. 24 hectoliters. The nose is deep and inspiring, gives you appetite. Mouth : balaced, refined and subtle, a real pleasure. These guys at the AOC commission, they don't swallow the wine, don't they ? Costs 11 € w.t. He begins to sell the wine now. Thierry Allemand - Cornas Reynard 2011 The next barrel if I remember was the one of Thierry Allemand, who by the way had trained Hirotake in his early years as a winemaker, and Lallemand had brought his Cornas among other cuvées, a good opportunity to have a sip for his wine, because his retail prices are quite high. __ Cornas Reynard 2011. Old vines (40 to 100 years). 24 months in casks too. 6000 bottles. 1 gram SO2 added at the blending of the casks after the élevage, none before or after that. Mouth : exceptional, again this lovely incisive minerality that you can associate with freshness. The fermenting grapes were stomped (pigeage) twice a day along 2 or 3 weeks so as to liberate the sugar progressively into the juice. This wine is bright, splendid and fresh, a lasting delicacy. Costs 38 w.t. and retail at Caves Augé was 73,6 €. Matthieu Dumarcher Matthieu Dumarcher makes wine from a surface of 5 hectares located in Baume de Transit, a village in the Rhone located east of the river at mid distance between Montélimar and Orange. His winery was set up in 2006 and his production is about 15 000 bottles a year. __ Léon & Séraphin, Vin de France 2013. Red wine made from Syrah, Grenache and a bit of Carignan and Cinsault. 4500 bottles. Fresh and easy, in the mouth, it glides gently on the palate, I like that wineh, with an almost lactic touch. Costs 9,9 € retail (tax included) at Caves Augé. __ Côtes du Rhône Vieilles Vignes (old vines) 2012. 70 % grenache & 30 % carignan. 70-year-old vines. Bottled in november of the folowing year. 3500 bottles. 14,5 % alc. I can't read my notes (bad hand writing when in a hurry) but from I understand I loved this poweful wine. Asked how he makes such a wine, he says that he plows and takes care of the soil, and also he highlights the importance of coosing the right day for picking, this is a very difficult issue. No spit, hee again, a discovery for me. Costs 13,6 € retail at Caves Augé. __ Côtes du Rhône Reserve 2012. Made with a selection of casks, no parcel in particular. Not for sale (sold out already). Exceptional freshness (or minerality, I don't know) here, it may be sold out but you may find this cuvée somewhere in a wine shop, don't pass this one. Really magic, no spitting. And costs only 17,5 € retail (if you ever find a few remaining bottles). René-Jean Dard (Dard & Ribo) René-Jean Dard was there for the Dard & Ribo wines, and I couldn't resist a stop at his barrel. __ Dard & Ribo Crozes-hermitage C'est Le Printemps 2013 (spring wine). Syrah. A bit of cask ageing but mostly vat. A gorgeous primeur, even if the nouveau and primeur is a matter of the past now. Se boit comme du petit lait like we say in French, in other words you drink it so easily. A wine to get your hands on if you can, but it should be sold out quickly. Costs 15,5 € at Caves Augé thay day. __ Dard & Ribo Saint Joseph 2012. Color : turbid and lightly milky. What a wine in the mouth ! Extraordinary wine, fills the mouth and the throat, coats it beautifully. You eat and you drink at the same time, you feel the healthy-food side of a real wine, it's so obvious but I can't explain that actually. Frsh and magic. Costs 26,45 retail at Caves augé. I also tasted the wines of Eric Pfifferling (Domaine de l'Anglore), Eric's wines are in high demand and often sold out very quickly, I always recommend to buy any bottle you could see popping up in a wine shop because you may not see it the next time you visit the shop. __ Lirac 2012, from Eric Pfifferling's négoce (purchased grapes). Grenache Blanc, vat sample, not bottled yet. Quite powerful and ripe aromas. Elevage : 24 months, the malolactic took its time. __ L'Anglore Chemin de la Brune, Vin de France 2013 (rosé). Direct press of Grenache and Cinsault. Bottled in april, 1,5 month before this tasting. Freshness and elegance. 4000 bottles. Eric says that if the vineyard had been located on the Taver area, it wouldn't have passed the AOC agreement because the color of this rosé is too light, to clear.... Swallowed, this wine is also quite magic, Eric says that the vintage was relatively cool which brought a later harvest thanks to which he got good maturity with lower alcohol levels. He says this wine should cost around 17 € retail. __ L'Anglore Tavel 2013, not bottled yet, wil be bottled in june. Generally, he says, mainstream Tavel wines are already bottled in december... Quite a clear color if this was a red, it's in between actually. Grenache, Clairette, Carignan. 1/3 each. Usually there's 60 % of grenache but the flowering turned bad and this had consequences on the yields. Nose : appealing. Mouth : acidulous, very vivid and full of energy. Color : a bit onion peel. Will sell for 17 € to 19 € retail. __ L'Anglore Terre D'Ombre 2013. The mouth is another great vinous experience, with this fresgness alongside the sharp minerality12 hectoliters of this wine. Hervé Souhaut I then tasted the wines of Hervé Souhat (Domaine Romaneaux-Destezet), a domaine created in 1993 in Arlebosc, a village deep in the mountains west of Tournon (Rhone). __ Hervé Souhaut Vin de Pays de L'Ardèche white, Viognier Roussanne 2013. Hervé says that this white has more freshness than usually, he says, it may be because he harvested a bit earlier, something he decided to do because the last days were so hot. 8000 to 10 000 for this cuvée. Costs 16 € at the wine shop. __ Hervé Souhaut La Souteronne 2013. Gamay : rare in the region as you can guess. There was already a surface of gamay that had been planted in 1920 and he replanted some more, using a local massal selection (from wood that had already adapted to the local conditions I guess), this at an altitude of 400 to 450 m. The granite soil works well on the wines. 10 to 15 000 bottles. Hervé's wines are also pretty much sold out already : he says that apart from the white all his reds are "reserved", and he sells 70 % abroad to 20 countries beginning with the United States and Scandinavia. The wine has a nice bitterness. __ Hervé Souhaut Vin de Pays de L'Ardèche Syrah 2013. If I can read my notes, the altitude of the vineyards puts them outside of the appellation. Delicate mouth with faded-flowers notes. The substance isn't very strong but still delicate. __ Hervé Souhaut Saint Joseph Cessieux 2013. Cessieux is a lieu dit, a parcel name. This is a new vineyard he works with (20-year-old vines). Nose : peony. 6 to 7 months of élevage, like usual. Swallowed : freshness and minerality. He gets always lots of acidity in his wines, he says. He always keeps the sems for the vinification. Altitude of the vineyard : 200 m. Superb wine. 13 % alc. 6 to 700 bottles (not a lot). Costs 25,5 € that day at Caves Augé. supposed to be dangerous and polluting. brushing aside the fact that a single cough of any volcano around the world releases the most naturally much bigger quantities of fine particles, some big-government lobbyists have deciced to put wood stoves in their cross-hair with the aim of forcing people to change the way they heat their homes or cook. In France, if a move in this direction is made one day, it could be motivated by tax reasons, the bankrupt state beeing tempted to hide again behind environmental motives to exort money from stove owners and/or purchases of heating wood, most of these purchases being made in cash from hand to hand between country people. A recent article in the Wall Street Journal, written by Paul R. Lepage the governor of Maine (where many families use stoves routinely) sums up the threat we fans of wood cooking and heating face with this regulatory push made in the name of environmentalism. This is an important issue because if the American EPA succeeds in its project to set up drastic new regulations for manufacturing and operating wood stoves, this could spill over and major Western-European countries would follow suit, too happy to find another excuse to create new taxes and controls over the way people conduct their daily life. B. and me went recently to a professional tasting event named Renaissance de la Maison Leclerc-Briant. 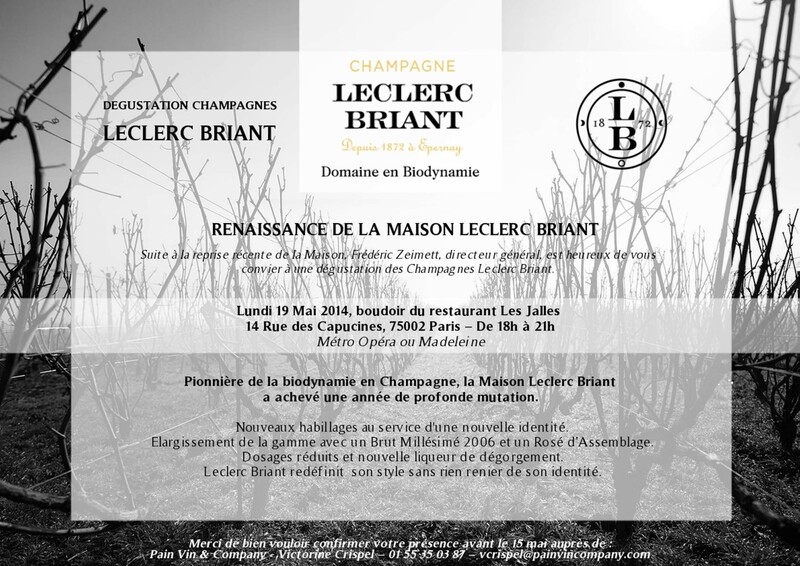 the event was organized by Pain, Vin et Compagnie in the restaurant Les Jalles (2nd arrondissement) and was centered around the last Champagne wines of Leclerc Briant, a pioneer Domaine in Champagne for its introduction of the biodynamic vineyard management in 1990. The transition brought lower yields and better quality. The man behind this story died suddenly alas on october 6, 2010 and it seems that taking the reins of the domaine was arduous although one of Pascal's 4 daughters, the oldest, Ségolène, tried her best for a while, which was not easy first because in France the inheritence taxes are so high that you're virtually obliged to break a company in pieces if you want to retain some part of it. She was thus obliged to sell vineyards, some 10 hectares to Champagnes Houses, Paillard, Lanson and Rohderer, the latter ending up buying the Domaine when the sisters decided to stop the adventure. Lastly, as Roederer was considering selling again, American investors who had been looking for a domaine were tipped about it and Leclerc-Briant was purchased in 2012 by Mark Nunnelly and his wife who happily weren't interested in quick returns but were focused in putting this qualitative Champagne house back on tracks in line with what Pascal Leclerc-Briant had in mind. Mark Nunnelly and his wife Denise Dupré are said to be francophiles who were looking for an investment related to wine in this country. Mr Nunnelly is a financier and Mrs Dupré teached in Harvard and is the former dean of Boston University’s School of Hotel Administration (source : scroll 1/3 down) and she worked extensively in this field in New England. All the while tasting several Champagne wines, we could chat a while with Hervé Jestin, the consultant of the domaine. 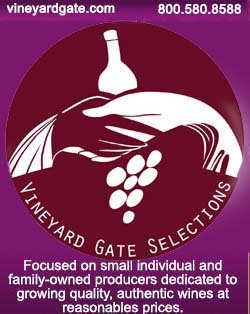 Mr Jestin has a wide experience as a consultant including abroad (he works in Russia too) and he has a passion for biodynamy, including its aspect in the winemaking, something he says is not well documented. Hervé Jestin worked with Pascal Leclerc-Briant for two years beginning in 2009 and helped accompany the domaine after his passing away. When the American couple bought the winery, there was almost no vineyard left, only one hectare (from what I understood), and their first goal was to buy back the vineyard surface, today they reached already 8 hectares (one hectare of Grand Cru Champagne costs today between 1,6 and 1,8 million euros). All the Champagne we tasted that day by the way (the bottles that you find in the retail), come from the stock, they have between 2 and 3 years worth of stock for the different parcels that were sold, leaving them the time to reconstruct the vineyards and the future wines. Roederer accepted to give back a few hectares from the 12 that they bought in total, but the American couple couldn't do the surface recovering overnight. Today they have 8 hectares (signed purchases) on which they're going to work soon and the goal is to reach a total of 12 hectares of owned vineyards in the future, not counting of course the purchased grapes. They're are very near purchasing a 1,6 ha and another 1 ha surface, which means the goal could be achieved soon. On the long range, Hervé Jestin says that the owned/prurchased grapes should be equally split (50% each), they will meet the growers soon, they're 30 and these growers follow the vineyard management of Leclerc-Briant. Right now, Mr Jestin says, they're beginning at Leclerc-Briant to release their first Champagne wines without SO2 adding. He says that the problem with the SO2 is not the quantity (when they add some, it's in the range of 20-25 mg compared to the 150 mg maximum allowed by the European rules), it's more the origin of this SO2, some being more nocive than others. I didn't take note but what we tasted and drank that evening was up to the job. Special thoughts to this rosé 1991 for its historic mark. We had begunwith the two entree cuvées which wer delicilious even if the dosage was higher than in the following wines. French vineyards are getting irrigation (Illustration pic : San Joaquim valley) I stumbled recently on an article by Sandra Laffont (AFP) dealing with the growing use of drip irrigation by farmers in France and I learnt that irrigation was also developping in the vineyards of southern France, countering the commonly-admitted idea that irrigation was only allowed for table-grape vineyards in this country. I emailed Mrs Sandra Laffont and could thus reach other persons dealing directly with that issue, namely the person in charge of the local solutions for farmers at the French branch of the Israeli company Netafim which sells the drip systems here. Israel is the country where the expertise for drip irrigation is the most advanced (it all started there and that's why they turned deserts into rich agricultural land), and the French wineries interested in setting up these systems are mostly large wineries or coopératives of the Languedoc and Provence where summers can be punitively harsh and dry. The systems purchased by these French wineries are both on-the-wire models (hanging above the ground) and sub-surface (buried 25-50cm under the soil with almost-direct access to the roots (the other, untold advantage apart from using less water being that a clueless visitors doen't see the irrigation). Read the Netafim page on wine-grapes irrigation for more details. On this page you can see a sketch of the web of water lines covering a vineyard (in Washington state). The line of metal tanks above are sand filters and the white tank(s) is probably the nutrient/fertilizer (fertigation) tank from which the liquid nutrients are pumped into the water line. More details about fertigation here. I called the man in charge of the agronomy solutions for the French branch of Nefatim, and he told me that drip irrigation has been allowed by a décret (law) of the INAO (the French wine authority) in 2009. He estimates that 20 000 hectares are now already irrigated in soutthern France, mostly in the Languedoc and Provence, plus a bit in the Rhone and even in Bordeaux. Among the clients who purchased the drip irrigation system, you find for example the Cellier du Nouveau Monde in Puicheric (Aude), the Domaines Sacha Lichine (Provence) or Chateau Lacoste (Corteaux D'Aix). None of these estates tells anything about the issue on their websites but you can see the drip system on one of the pictures rotating on Chateau Lacoste's website. In addition to the water irrigation, these systems are also used in France to deliver nutrients and minerals directly to the roots area, like it is made abroad (see the white tanks on the picture above) with sophisticated systems where the liquid fertilizers are mixed upstream with the drip water, rendering useless the costly use of tractors and staff to drop the products. I will never look down again on the wine of Montmartre as a tourist thing only worth the (expensive) souvenir shops. I had the opportunity to taste with friends a cuvée made from the 1500 square meters of vines (1700 of them) growing in Montmartre. We were gathered around wines of the Paris region and one of us had had to find the wines, 6 of them, which was not the easiest thing to do as they're either sold out or not for sale to begin with, like you had to find the non-profit who made them and find a way to get a bottle. From what I understand each year get's a new name at the Clos Montmartre and 2006 was the Clos Brassens. It's bottled in 50 cl, which means it ages faster than in a normal size. This bottle was # 00082 and the label states that this wine is made "Au profit du comité des fêtes et d'action sociale du XVIII arrondissement" (in short, non-profit, returns given to local social services) . It says also that it was bottled in the basement of the town hall of the 18th arrondissement (probably the first time I hear about a wine being bottled in a town hall). The wine is a blend of 27 varieties but mostly 75 % gamay and 20 % pinot noir, the remaining 25 varieties (Seibel, Merlot, Sauvignon blanc, Gewurztraminer, Riesling etc...) making the 5 %. This vineyard was planted in 1929, I've read somwhere that they were planted by locals to prevent the construction of a low-rent building, but the hill is said to have been planted with vineyards before that time. This is a beautiful wine, lightly evolved already, you can see it from the color (I'm not sure it was kept in a cellar, from what I know), friand or excitingly appealing. The wine gets down easily, it's elegant and gives the gentle feel of "true" wines, I'm surprised, the wine of Montmartre is more than what it seems from afar. This costs 40 € when it's released but it's almost immediately sold out and some people ask several hundreds of euros for a bottle on the Internet. The other bottle is a Clos Montmartre cuvée Jacques Prévert 1999, we didn't open it, it's owned by the friend who directed this tasting and he keeps it for the future. Traditional sake vessels In my story about the Shinkame brewery in the Saitama prefecture I wrote about the changes that occured in the sakemaking in Japan during World War 2 (as recounted by owner Yoshimasa Ogawahara) when, because of dire shortages of rice the breweries were encouraged to use subterfuges and various additives (sweeteners and added alcohol). From then on you virtually couldn't find any real sake (Junmai-shu) in Japan, that is, made from only rice, water and yeast, it was instead an artificial beverage with large amounts of additives. But I learnt much more recently about the issue while reading Zoom Japon, a free magazine published in Paris, the april issue of Zoom (Pdf) being devoted to "Sake, the soul of Tohoku". You can read in here (in French only alas) several insightful articles about key breweries and the people who represent the tradition and the quality. One of the articles (page 9) signed by Makiko Segawa gives surprising statistics about the composition of non-junmai sake. First she says that the government has pushed for the continuation of the alcohol/sweeteners use even after the war, and this, for profit (taxes) reasons. She writes that still today, 70 % of the sake produced in Japan has alcohol added to it, and it's not even Japanese made alcohol, but foreign, imported from (take a seat) : Brazil (55%), Pakistan (20,7 %, Indonesia (13,2 %), China (5,7 %) and Thailand (4 %)... And she adds that the three Tohoku prefectures that were affected by the tsunami and nuclear accident a couple years ago re the ones where the breweries were the less reliant on foreign alcohol. According to her, the Tohoku breweries have been leading in the search for quality and authenticity in the sake making. This april issue of Zoom had a few reports about key Tohoku breweries and sakemakers, some very young. I'll contribute again with my own stories about the famous Daishichi brewery and the small very old-school Himonoya brewery, both in the Fukushima prectecture (also in Tohoku). If, like for wine ypu prefer to drink sake that got no additives like sweeteners and alcohol, always choose Junmai-shu sake. Like natural wine corrected wine, junmai-shu is still a minority compared to the whole production, but it's clearly labelled (in Japanese at least). Website of Zoom Japon, the Japanese free magazine of Paris (you can download the past issues through its archives section). European judges rule on the Internet : Run for shelter ! The European authorities building the best possible world against the citizens' will : there may be soon a big difference from the Internet as it is known in its country of origin, the United States, and the one unsuspecting websurfers will see when browsing from Europe. Thanks to our supreme European judges (European Court of Justice'), the early stage of censorship may be just around the corner. In its relentless fight against Google which is viewed obsessively by European (and French) authorities as the archenemy impersonating the American menace, the judges have ruled that Google should delete links allowing users to connect to pages deemed unfavorable by complaining individuals who dislike the way they're pôrtrayed in these pages. Even if this content doesn't breach the law, Google would be obliged to terminate the links to make it more difficult for websurfers to reach these pages. For example, an individual having been condemned in the past for conterfeiting wine, or someone like Pancho Campo who was in the middle of a wine scandal linked with the Wine Advocate's doings in Spain could have Google delete (for its search results in Europe at least) the links to incrimanting webpages so that these individual can have their present reputation safeguarded and whitewashed, even if this censorship will prevent other people to know better when they look for information about a given person, for example when they're considering business deals with them. Read also this opinion piece found on the Wall Street Journal and titled Airbrushing the European Web, it's amazing that so few people here recognize the threat. It is likely that in the near future, serious internet users in Europe will, like in China or Saudi Arabia, use proxies to have access to the real version of the Internet through a U.S. IP in order to go around the European censorship. This ruling is probably the first step before further censorship moves, of course under the pretext of protecting European readers. Beware of those who want to make your own good, they're generally heading for just the opposite. Another step in the direction of censorship of the Internet by a European body came last october (2013) with the European Court of Human Rights ruling in the "Delfi AS vs Estonia" case. This may be obscure for you but the future of commenting rights in the EC may be at stake and major Internet players have warned about this ruling. Delfi is one of Estonia's largest websites and it was sued for a comment considered defamatory by the local Ferry company, even though the comment was deleted when flagged. This landed later in the European Court. The ruling could force all websites in Europe to deactivate the comment section or face huge fines if a defaming (or considered as such by anybody) comment passes through the moderator (even if it is deleted shortly after when flagged). Read the detailed article of the FT on this little-known affair (by John Sunyer). Speaking of the EC and Brussels, we can indulge in a rant with this funny (if appaling) video which was forwarded to me by a Russian friend who's been living near Paris for years now. It's made by a Dutch reporter working for GeenstiJl TV and with the help of a Dutch MP-insider (Daniel van der Stoep), it's both in English and Flemish (subtitled in French). At one point (min 04:00), two European MPs react violently and strike the reporter after being caught red-handed signing in (but not working) to get their 300 € daily expenses allowance. Read a report in English on this episode.